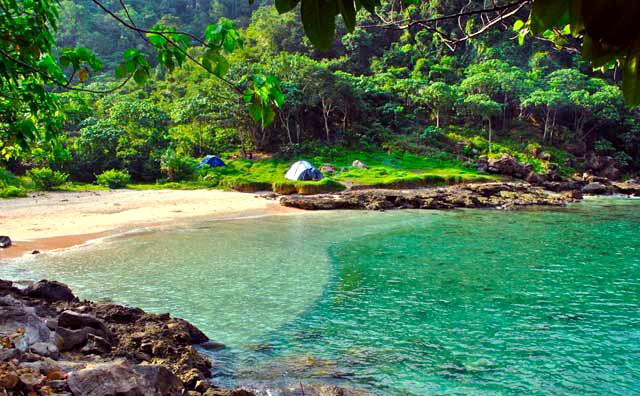 An amazing beach resides in Aceh Province and it is called Lhok Mata Ie. To be exact, the location is in Gampong Ujung Pancu Village and the beach belongs to Peukan Bada Sub-District. The beach is famous for its stunning atmosphere and peaceful nuance, so visitors can really relax there. In fact, visitors can do almost anything on the site including swimming, water sports, relaxation, beach walking, photography, etc. On top of that, it costs almost nothing so you can save much money for the vacation. Make sure to come with your family, though. The unique characteristic of the beach is its short shoreline, which is only about 25-30 meters. Due to such size, it feels like a private beach when tourists spend some time there. The sea water is blue and it does not feature big waves at all. No wonder, the beach is safe for swimming and other water sports. At noon, the sea appears more beautifully due to the reflection of the sun. Not to mention the weather feels so warm and comfortable. In the back, you might see bushes and dense trees as well. The sand is light brown and it comes with soft texture! One of the reasons to visit Lhok Mata Ie Beach is the affordability. Even though tourists need to pay for the entrance and parking fee, the price is cheap. If you do not want to spend money for foods, you can prepare snacks and bottled water before going to the beach. However, you can spend some money if you want to taste local foods in a nearby village. The next fun activity is hiking, as the beach resides near to a hill with its dense trees. As for the tip, it is better to prepare the supplies prior to hiking. The reason is none other than the absence of food vendors and other services on the site. Also, it is important to wear proper footwear and equipment before hiking. The next charm of the beach is the presence of shady trees and bushes. Somehow, they create a comfy nuance to the location where tourists can relax and enjoy the nature. What is next? Some people take advantage of Lhok Mata Ie Beach to enjoy a fun activity called camping. The most crowded time for camping is indeed on the weekend when local teenagers come to the beach and build a tent there. If you do not like crowd, you can choose any days but weekends and holidays. The thing is that you must carry your own equipment and supplies. Later, do not forget to enjoy fishing too! From Banda Aceh City, a trip to Peukan Bada Sub-District only takes about 30 minutes as the distance is 11 km. Once you have arrived at Gampong Ujung Pancu Village, the next destination is definitely the beach which takes only several minutes by walking.